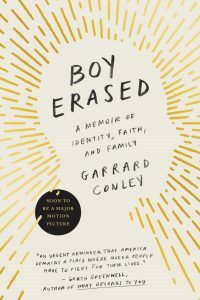 Garrard Conley is the author of the New York Times Best Selling memoir Boy Erased, now also a major motion picture. Growing up in a small town, immersed in a faith-based community, Conley survived conversion therapy before becoming a writer, activist and speaker. He lectures at schools and venues across the country on radical compassion, writing through trauma, and growing up gay in the complicated South. He works with other activists to help end conversion therapy in the United States and abroad. He is also a returned Peace Corps volunteer, having served in Ukraine as an ESL instructor and HIV/AIDS educator. Conley’s writing can be found in The New York Times, TIME, VICE, CNN, BuzzFeed, Them, Virginia Quarterly Review, and The Huffington Post, among other places, and he is currently at work on a novel about queer 18th century lives. In today’s conversation, we explore Garrard’s personal journey, his career as a writer and advocate, and how it feels having your story told in a major motion picture featuring Nicole Kidman, Lucas Hedges and Russell Crowe. ZipRecruiter: Post jobs for FREE, go to ZipRecruiter.com/good. Blinkist: Key takeaways from the world’s best nonfiction books in text and audio. Go to Blinkist.com/GOODLIFE to start your free 7-day trial.